Osprey Publishing are probably best known for their huge range of military history books, but recently they have branched out into gaming and adventure books. 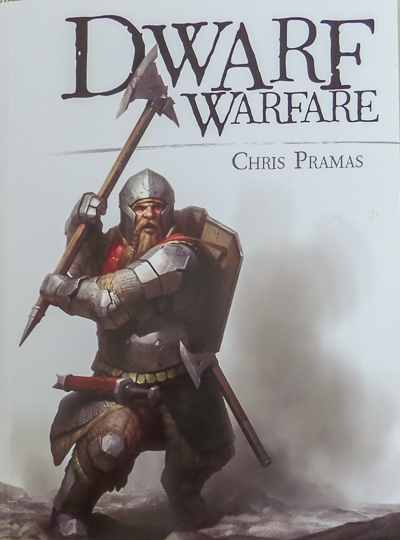 Being a dwarf collector and gamer, I picked up one of the warfare books (the other two being on orcs and elves). The book is the usual style for Osprey - softback, a bit smaller than A4 size and 90 odd pages long. The book is written in a semi factual style, the introduction explains that it is an examination of fantasy tropes. As you read through it becomes clear that Tolkien's influence (and thereby the Warhammer world) looms large, with a smattering of other backgrounds adding to the mix. 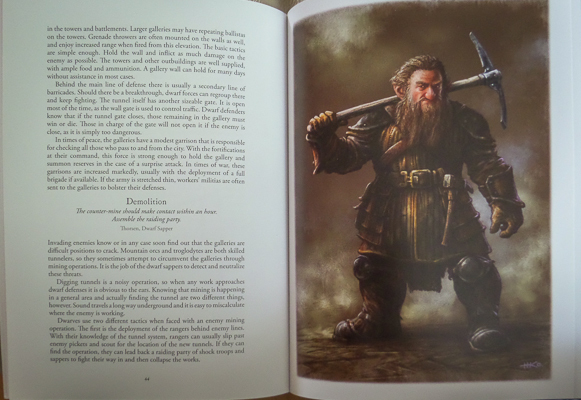 The book is split into four chapters, Dwarfs in general, dwarf troop types, dwarf strategy and finally some infamous dwarf victories. The writing is concise and informative, the illustrations are nicely done and are split between smaller black and white line drawings and full page colour spreads. It's a good quality product, as you would expect from a long standing publisher. The first chapter covers dwarf origins and society, their deities and generally the way they live and integrate in the world. The second chapter looks into dwarf military life and discusses various troop types - the expected heavy infantry, crossbow, and war machines, with a smattering of more unusual types like bear cavalry and gnome woodwalkers (I suspect this comes from the D&D world but I'm no RPGer so could be wrong here). 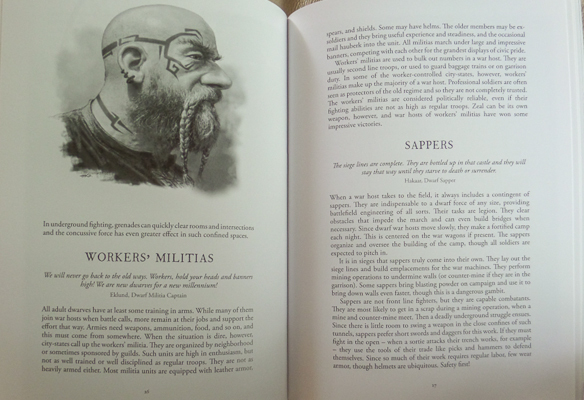 The third chapter covers dwarf strategies in the field of battle and in siege warfare. It offers some interesting insights (to a dwarf player at least) as to why dwarfs tend to fight defensively. The final chapter relates some infamous dwarf victories against orcs, elves and men - I have to admit I found this the least convincing chapter as it tells tales about "famous" dwarfs that have no background anywhere else, so it's hard to be engaged here. Tales of Thorin's exploits or Thorgrim GrudgeBearer I would lap up, given my long history with the Tolkien and Warhamer worlds. These reservations aside, I enjoyed the book. It's not a long read, you can whiz through it in an hour or two. I am a bit puzzled as to the target audience. Warhammer and Lord of the Rings players have long and rich backgrounds to draw inspiration from, as presumably do players of other long established systems such as D&D, so it's not "needed" by them. Newcomers to fantasy gaming who do not relate to these worlds and have recently discovered a non-descriptive gaming system, such as Dragon Rampant, Mayhem, or Saga may well find it useful to have their dwarf army grounded in some lore. At a retail price of £10 it's not overly expensive, and certainly not much more than the cost of a couple of gaming magazines. Lightweight and Portable Gaming Board? I spotted these in Halfords (UK car parts shop) the other day and thought they might be feasible to use as a lightweight gaming board. Weighing in at just over 2kg and costing £10 I thought it was worth investigation. 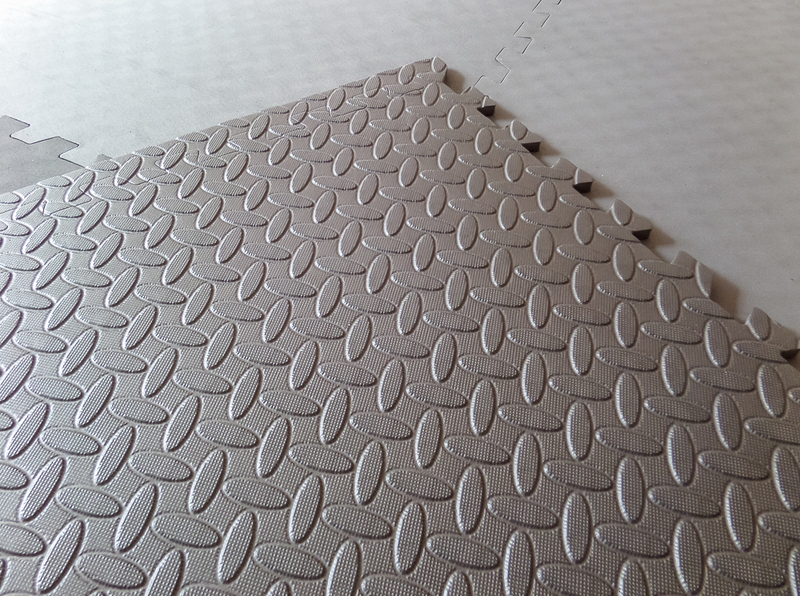 As you can see from the wrapper, they fit together to make a 6x4 board. My dining table is 5x3, which is fine for skirmish games like Saga, but can feel a bit cramped for Warhammer, even Dragon Rampant. So I was hoping that it would provide a cheap solution. 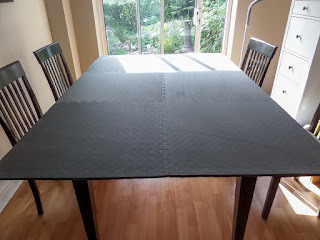 I could either use it straight from the pack as a table extension, draping a cloth over it, or add some texture and paint. Opening up the pack, there was a fairly strong chemical smell - there is a little card in there suggesting they are opened in a well ventilated room and left for 24 hours. I pieced them together and was surprised how snugly they fit together. 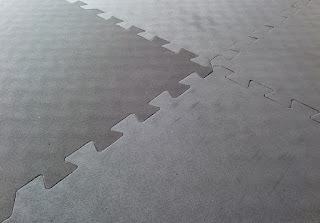 However, they are very light and would be unsuitable for use on a small dining table, the overhanging areas would not be rigid enough, I doubt they would hold the weight of a metal regiment. 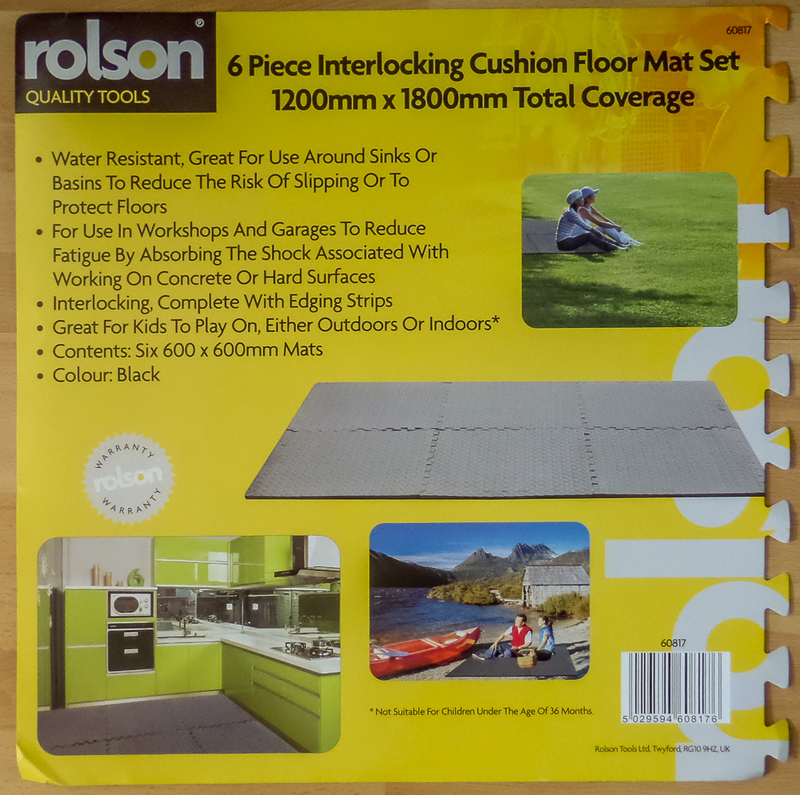 I will probably put them to use in my garage, laying them on a large table (table tennis size). It remains to be seen how well they take pva glue, texture (sand, gravel, etc) and paint - that's an experiment for later in the month I think. 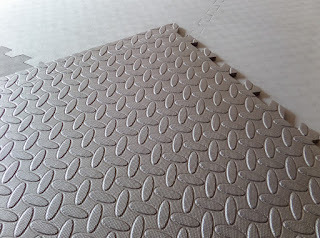 Tile reverse, maybe useful in a sci fi setting? After the long, slow slog with the recently painted Warhammer dwarfs, I wanted a change of pace - something that would be quick to paint. I have always found the Lord of the Rings range fall into this category, so I delved into my pile of unpainted minis and found some nice candidates. Five Riders of Rohan fit the bill perfectly - just enough to make up a useful number on the battelfield, but not too many to be a daunting task. I have already made a start and painted the horses, the riders are still to be done. There are a couple of character models in here - Eomer centre front and the banner bearer. Eomer will lead the force into battle, while the banner bearer is a useful figure to mark out a unit as something different from the normal troops - a unit of Royal Guard. 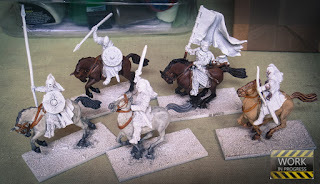 When finished these will join my already painted Riders of Rohan to make up two or even three units, depending on which game system they are used in. I also have some foot troops lined up, with a couple of metal characters similar to above, including a rather interesting recent ebay acquisition.